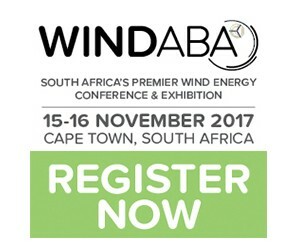 Under the theme ‘Wind Power: Building futures’, the 2017 Windaba Conference and Exhibition aims to bolster strategic partnerships and cross border alliances on the Continent and globally. The conference, now in its 7th year, has been well established as a must-attend event for Wind Power and renewable energy stakeholders. The conference programme has been tailored to offer unique and credible insights into how to build a sustainable emerging Wind Power Market. South Africa and the Continent, with its abundance of natural energy resources remains a market with enormous transformative socio-economic potential. To this end we have gathered Global Renewable and Wind Energy Thought leader. In providing stakeholders with a Global Perspective on Wind Energy, we are pleased to announce details of the Windaba 2017: Opening Plenary. The session discussion will focus of global alliances and evaluate the value proposition of the South African Wind for the world market. Don’t miss your opportunity to showcase your company and meet your target audience. Exhibition space still available, register now SAWEA & GWEC members receive a 10% discount!